Joseph was given his message in a dream - if you would like to see this fabulous video and hear December Song (I dreamed of Christmas) please click on the arrow. 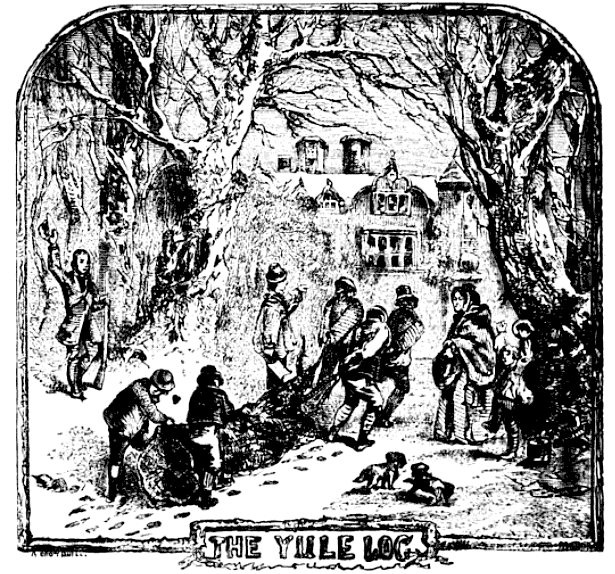 The first mention of the Yule log in Britain is a written account by the clergyman Robert Herrick, from the 1620s or 1630s. Herrick called the tradition a "Christmas log" and said that it was brought into the farmhouse by a group of males, who were then rewarded with free beer from the farmer's wife. Turn your oven on to gas 6, 400F/200C – that’s a hot oven. Next you need to grease Swiss-roll tin – that’s a shallow tin, 13 inches x 9 inches (or 33 cm x 23 cm if you are metric). Line the bottom with grease-proof paper or baking parchment. 6 medium, free-range eggs – separate the yolks from the whites. Whisk the whites in another bowl until they are firm stand up - and won’t fall out if you tip it upside-down over your head. 1 oz plain flour (that’s 25 gm) – sifted. Half-a-pint (10 fl oz) double cream (that’s 300 ml) – whip it until stiff. In a large bowl whisk the egg yolks and caster sugar together really well until they are thick and creamy. Then add the sifted cocoa powder – it’s best to sieve this again into your bowl to get more air into the mix. Gently fold the cocoa into the mixture. Next, fold in the whisked egg-whites followed by the sifted flour. Pour the mixture into the Swiss-roll tin and pop into the oven for 15 minutes. When it’s done (it will be well-risen and firm to the touch) remove from the oven and cover with a clean, damp tea-towel and leave it to go cold. Cut the sponge into six even rectangles (it’s easiest to cut it down the middle lengthwise then across evenly twice). Spread each strip with the cream and roll-up into logs, leaving the paper behind. If you would like a large log which you can slice, just don't cut it up; spread it with cream and roll it up. Mix them all together and spread over the logs. You can dust them with icing sugar to give the snow-effect. And here are the six little beauties - they won't last long! And the unusual thing about Rudolph? He must have been a girl as the The only female deer with antlers are reindeer.